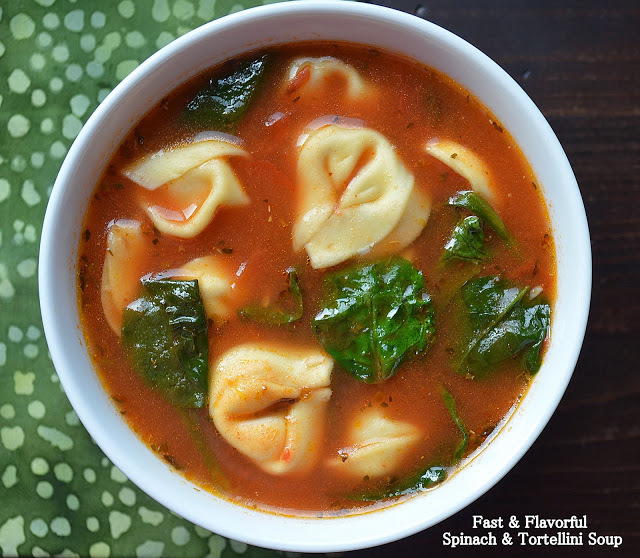 THIS Garlicky Tortellini Soup with Tomato and Spinach soup was ridiculously good! I absolutely loved it! I was flipping through a cookbook from my stash of books, one I really don’t think I have paid attention to and BAM, I saw this soup and needed to try it. I must say, I now see about 5-6 other recipes in this book I need to try soon as well! The book is called Not Your Mothers Weeknight Cooking by Beth Hansperger. This soup was seriously delicious and so very quick and easy to make!! It is perfect for a satisfying meatless lunch or as a dinner with a great side salad and a hunk of warm bread. It will absolutely be a regular for me from here on in! I am not one who loves spinach, I need it disguised to eat it if you know what I mean…but man! The flavor the spinach took on in this soup was really, really good! Heat the oil in a large pot over medium heat. Add the garlic and saute for no more than 45 seconds (do not brown). Add the chicken broth and red pepper flakes. Increase the heat to high and bring to a boil. Add the tortellini and cook for half the cooking time on the package. Add the tomatoes, reduce heat to medium-low and continue cooking until the tortellini is tender. Stir in the spinach and cook until it wilts (about a minute). Season if necessary with salt and pepper. The flavors of this soup are good immediately - something I don't usually find with soups. What a great dinner this would be! I love tortellini! I need to get some spinach but I have everything else to make this. Looks great. That looks right up my alley. Really delicious! I am making this this week! Made this tonight and it as very good. Doubled up on the garlic and the red pepper flakes but that is our taste. Will definitely make thi again. Awesome! We make this a lot! It’s my youngest’s favorite…However, she isn’t (yet) into spicy foods. I always spice my portion up a bit. This soup is soooo good.